Southwest Florida is a breeding ground for various types of ticks that can seriously harm humans and pets. Brown dog ticks typically target dogs as a preferred host. These ticks rarely bite humans, but can transmit diseases to dogs. Female ticks that attach themselves to dogs lay thousands of eggs after becoming engorged. Eggs that are laid after a dog goes indoors can be found on the baseboards, walls and ceilings throughout a building. American dog ticks are very common in Florida. 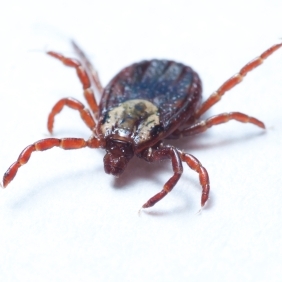 While these ticks also prefer to feed on dogs, people who spend time in the woods may find that these ticks have attached themselves to exposed skin. American dog ticks in the nymph stage prefer to feed on rodents. Professional pest control services can help keep the dangers of ticks at bay by utilizing professional techniques that require specialized training. Residential and commercial properties can have a tick control service completed to protect people and pets against ticks. Venice Pest Control offers a lawn application treatment that can be done every other month to ensure that ticks will not be a nuisance. Venice Pest Control is your first line of defense when you're dealing with the dangers of ticks. We have been providing high-quality pest control services at affordable prices for nearly 40 years. Honesty, quality and dependability are at the heart of our company's mission when we provide you with tick control services. Contact us today to learn more about our services and to receive a free, no-obligation quote!